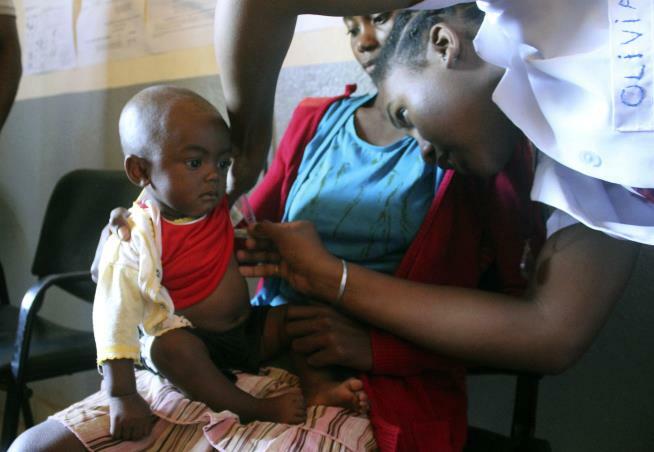 (Newser) – Babies wail as a nurse tries to reassure mothers who have come to vaccinate their children against a measles outbreak that has killed more than 1,200 people in Madagascar, the AP reports, where many are desperately poor. The island nation faces its largest measles outbreak in history, with cases soaring well beyond 115,000, but resistance to vaccinating children is not the driving force behind the rise. Measles cases are rising in the United States and elsewhere, in part because of misinformation that makes some parents balk at receiving a vaccine. New York City is trying to halt an outbreak by ordering mandatory vaccinations in one Brooklyn neighborhood. In Madagascar, many parents want to protect their children but face immense challenges, including the lack of resources. Only 58% of people on Madagascar's main island have been vaccinated against measles. With measles one of the most infectious diseases, immunization rates need to be 90% to 95% or higher to prevent outbreaks. On a recent day, the Iarintsena health center's waiting room was full, with mothers sitting on the floor and others waiting outside in the overwhelming heat. Two volunteer nurses and a midwife tried to meet the demand. Nifaliana Razaijafisoa had walked 9 miles with her 6-month-old baby in her arms. "He has a fever," she said. "I think it's measles because there are these little pimples that have appeared on his face." The nurse quickly confirmed it. "I'm so scared for him because in the village everyone says it kills babies," Razaijafisoa said. The outbreak has killed mostly children under 15 since it began in September, according to the World Health Organization. People die from Measles because of Starvation. The body cannot create the required fever to kill the virus. It is a very safe Childhood Illness unless starvation is a factor. Stupid housewifes in 1st world countries. stupid politicians letting "refugees" into 1st world countries. stupid religious leaders There's your 3 reasons. Good Lord. There’s a Measles Outbreak in the US too. The CDC is dropping the ball. We’re not supposed to like 3rd world Madagascar.